Doire Trasna are in 'must win' territory against Ballymaguigan this weekend while Adie McLaughlin will be crucial for Craigbane against Steelstown after an unfortunate injury to Bliain Gormley. At the start of the league Castledawson were seen as one of the teams that could challenge Glenullin for promotion. While Glenullin have performed as expected and set the pace at the top of the table, that cannot be said for Castledawson who only ended a losing streak with a two point win over Steelstown last week. That, such a promising start. However, it would be churlish to write off St. Malachy’s who have been hit with a mini-injury crisis and will feel they still have the ability to give Glenullin a stiff test. They were back to near full strength last Sunday and that win over Steelstown shows they are recovering. Glenullin can afford to lose one game but not two so manager Liam Bradley will not want to see them freewheeling with the finishing line now clearly in sight. The Mitchel’s got their stiffest game of the season down the road at Ballymaguigan and will not be taking any chances. However, their scoring prowess, notably in the form of the Bradley brothers, sets them apart in this division and they should win again. Verdict: Leaders march on toward title. Craigbane suffered a big set back to their ambitions when Blain Gormley suffered a serious ankle injury at Slaughtmanus last Sunday. The influential midfielder could well miss the rest of the season which is a huge blow to the Lilywhites ahead of the Intermediate Championship. Neither team has lived up to expectations but in the case of Craigbane, injuries and retirements has been a major factor. Steelstown have had injuries too but their form has been such that manager Gary Duffy has now departed with experienced player Paul O’Hea along the line last week. Craigbane will be slight favourites to get a win especially with Adie McLaughlin and Lee Moore fit again. Steelstown had a very bad start, losing their first four games but since that the Brian Ogs have been gradually improving and could be a serious force when the championship starts if O’Hea gets them galvanised. Craigbane are hard to beat at home but that injury to Gormley could be vital. Verdict: Visitors could nick it! Doire Trasna’s hopes of avoiding relegation took a step in the right direction with an first win of the season at Moneymore last week and they are now just a point behind Lissan. Trasna have beaten Ballymaguigan in their last two league meetings but this year that form has eluded them and they are hanging on to their Intermediate status by their fingernails. Ballymaguigan are having a decent league run and sit third. Last time out they had four points to spare over Ballerin and will be favourites to carry that form into this game. Ballymaguigan’s strength lies in their direct play, strength and experience. They are not afraid to have a go from distance and in Gary Burke they have an excellent free kicker who has already scored 1-40 in the league. Trasna tend to play well in patches and get erratic at other times, taking pot shots from near impossible angles. 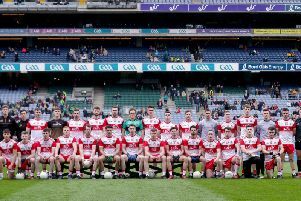 With Derry under 21 player Tomas McCrossan back in defence the Pearses will have a slightly better chance of saving their status. For them this is a must win game but after last Sunday nothing can be ruled out. This is a meeting of Drumsurn, an all-out attacking team, and Slaughtmanus who defend tightly and hit on the break. That will make it an intriguing affair at Billy Doran Park. Slaughtmanus have the lowest points tally but have also conceded the least in the entire division. Drumsurn are a bit more flamboyant but have also scored plenty and conceded plenty. Still, both are in the upper half of the league so there will not be any pressure for either in this game. Drumsurn will be hoping to have goal scoring full-forward Daryl Mullan back after injury but they still have Pearse McNicholl and Ciaran Mullan who are regular scorers. Slaughtmanus have found a very good scoring forward in teenager, Conor McGee, who is really their only front man who regularly scores from play. Kevin King is still out with illness and a big loss for the St. Mary’s in attack. With such a solid defence and Drumsurn a bit more generous at the back Slaughtmanus might just have enough to get a result. Verdict: Slaughtmanus but tight game. Neither team has been setting the world on fire but Ballerin are in a more comfortable position with four wins. Lissan are the physically stronger team while Ballerin are smaller but faster. Lissan have the excellent Paddy Coey leading their attack but needs support. Michael Quigley can give the visitors the edge at midfield and their direct style will heap problems on a Ballerin defence that has conceded an average of 12 points per game. Apart from a hammering by Glenullin, Ballerin have never been far away and probably should have had a few more points on the board. They never get it easy against the Tullynure men but the pace of their attack should see them finish in front. Lissan sit on three points and will be all out for victory but it may not be enough. Faughanvale have been the surprise team of the Division Two this year after coming up from the junior ranks. The ‘Vale have won seven of their 10 games and if form is anything to go by then they looked nailed on for this one. Moneymore will be very happy with their season. They carried the favourites tag for relegation at the start of the league but an away draw against Foreglen and a home win over Ballymaguigan made the people sit up and take notice. They are on a safe eight points but are a team that can dig out a result when least expected. Faughanvale, with an under-strength team, lost in their last outing to Glenullin but really they were never expected to take anything from that game against the leaders who look set to return to senior football. Joe Gray’s Greysteel men look strong favourites to win this game but you can never take Moneymore for granted. Moneymore lost at home to Doire Trasna last week but they will be hopeful of having injured midfield ace Christy Young back in the frame. Even with Young, they look short though against a team who looks to be heading in the right direction. Verdict: Looks comfortable for ‘Vale. Desertmartin were very glad to get a victory away to Lissan last week because by doing so they have significantly eased their relegation worries. They travel to second placed Foreglen in this round and on form it looks to be a very difficult task for the Longfield men. Foreglen received a stiff test away to Drumsurn last Sunday and in the wet conditions, just scraping a two point victory with the McCormick brothers in excellent form at midfield. The McGuckin brothers, Enda and Cormac, mustered up 2-10 between themselves at Lissan and they will be hoping to find the Foreglen defence just as generous but that is not likely. With a slim hope of promotion still off in the dim distance, Foreglen cannot slip up thought thoughts may have already turned to the intermediate Championship. Desertmartin cannot afford to give away too many frees with Kevin O’Connor around but they are a hardy crew and will make the O’Briens work. Foreglen who may be without county player Oisin Duffy cannot take them for granted but should win with something to spare.